You never know what challenges life is going to throw at you. This is a truth that we all know so well, yet there are certain events that the magnitude of which are hard to comprehend. Such an event is currently taking place in California, in the form of several devastating wildfires that have destroyed thousands of homes and businesses � and lives as well. The largest and most destructive of the fires is the Camp Fire, which started early Thursday morning in Northern California, and through a set of worst-case scenario conditions, it tore through the town of Paradise, catching the community completely by surprise, leaving people fleeing for their lives. Paradise is the town my wife, Katie, and I grew up in, and our friends and neighbors were the ones fleeing for their lives. Though I now live in Tennessee, which is much more conducive to pursuing a career in professional fishing, Paradise is where I have spent most of my life. It's a moderate-sized town, but it has the sense of community that you would expect in a town a fraction of the size. When I was growing up, I didn�t realize how infrequent this type of community was, but now that I�ve experienced so many other places across the country, I�ve come to appreciate how rare a town like Paradise truly is. 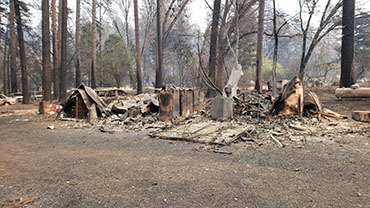 The home where the author grew up is one of thousands that have been destroyed by the deadly Camp Fire in Northern California. Now, in the blink of an eye, that town where I went to kindergarten through high school, where I joined my first bass club and fished my first tournament, has been decimated to a point where it�s unrecognizable. Eight football fields per minute. The rate at which the fire spread through the town was reported at 80 football fields per minute! At that rate, fueled by strong winds and dry conditions, the Camp Fire engulfed the entire town and swiftly destroyed over 90 percent of homes and businesses and the death toll is rising every day. It's the most destructive and deadly fire in California history. Of the more than 7,000 structures that are confirmed destroyed, my mom�s house � the house I grew up in � was also one of them. Fortunately for us, my mom has been staying with my brother in Augusta, Ga. recently, so she was completely safe while all her possessions were being rendered to ash. "Swift and complete" is what I would consider an accurate description of the devastation. Before I go on, I want to make this clear � our family is in great shape. Though we lost a lot of family history in the house, our emotional state is quite good as we are a very optimistic bunch. So, with that being said, I hope you don�t grieve for our family. I�m writing this in the hopes that it can create awareness for the great needs of thousands of families that aren�t so lucky � people who include many dedicated bass-heads just like you and me. As of now, the fire still rages on, and though the town�s destruction is complete, the community is still feeling the effects. Tens of thousands of the people I grew up with are now without homes and are displaced trying to find temporary housing, food and supplies wherever they can. In an effort to do our best to help friends and neighbors in need, my family has started a GoFundMe campaign that benefits the North Valley Community Foundation and its Camp Fire Relief Fund. I feel that donating to this local organization is a great way to ensure those in the most need get the resources they require. Though I have been working hard at setting the foundation for another big tournament year in 2019, and I look forward to dedicating this column once again entirely to fishing in the near future, for now, I hope this can serve as another opportunity to help a community I deeply care about. I hope you will considering sharing the message and donating, even if it's just a few dollars.